Supreme Garages specializes and is known for providing supreme quality, regardless of if you are looking for a budget conscience utility structure or recognizing the dream of any true auto aficionado or collector enthusiast. Need additional space? 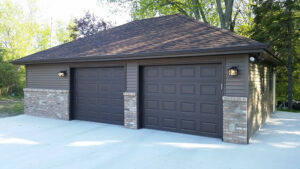 Your Supreme Garage can be constructed with a loft for storage or an office/apartment expansion. What makes our garages Supreme? We bring 25+ years of experienced craftsmanship. We are a locally owned small business that has built our reputation on using the highest quality materials along with the highest standards of craftsmanship. We strive on and ensure that you the customer will be 100% satisfied through the construction process of your new Supreme Garage.